As secondary ELA teachers, there are certain traditional activities that we tend to give our students during a novel study. These activities range from body maps to dialectical journals. After using the same activities over and over, I began to seek out new and innovative ways to target essential reading and writing skills that would interest students while also integrating modern technology. Here are FIVE Innovative Activities for Any Novel Unit! 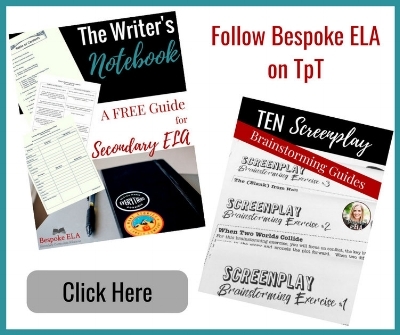 Each of these activities and projects can be found in the The Ultimate Novel Study Bundle: 50 Projects and Assignments for ANY NOVEL. 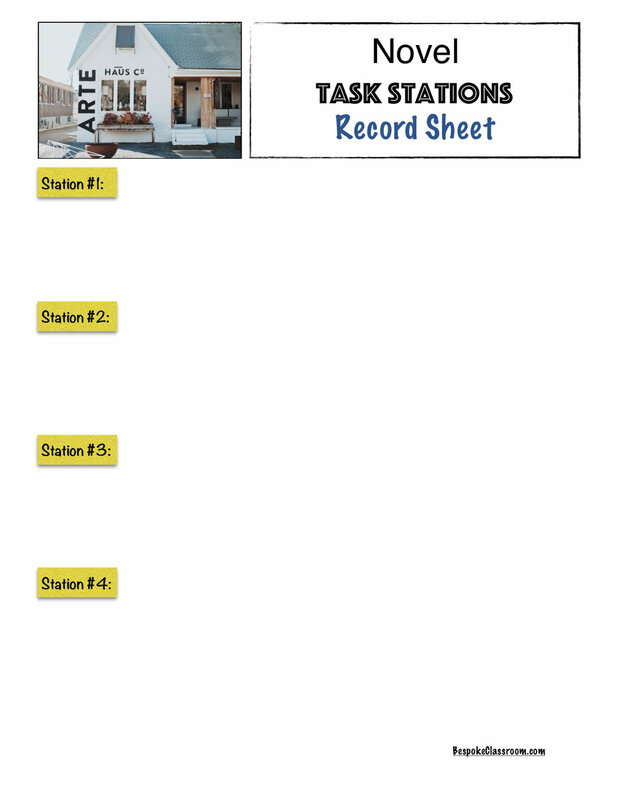 Have students get into groups and give each student the Task Station Record Sheet. Students record their responses and findings at each display on the record sheet. Alternatively, have students record their findings and responses in their notebooks or on their own paper. Give students 5-10 minutes at each “station.” Keep time for each rotation. Give students a one-minute warning for the next rotation and then announce when it’s time to rotate. After groups have visited all stations, students can share their findings with the whole class and turn in their record sheets for assessment. Consider also having students select one of the task stations to write about either formally or informally. Find this assignment with the Task Cards as part of The Ultimate Novel Study Bundle: 50 Projects and Assignments for ANY NOVEL. For this project, students work in a group to design a theme park based upon the literary elements of a selected novel. The various aspects of the park from the layout to the rides to the characters should be inspired by the novel. What are the major themes of the novel? How can than these themes be represented in a theme park? What are the major plot points of the novel? How can these be represented by the “lands” in the theme park? Who are the major characters of the novel? How can these characters inspire theme park characters and rides? What is the setting of the novel? How can this setting inspire the architecture of the park? How can the merchandise sold in the theme park relate to the novel? The purpose of a headline is to simultaneously report key information while grabbing the attention of the reader. A good headline tells what the article is about and makes you want to read it. Therefore, the words within a headline must be carefully and purposefully chosen in order to serve two purposes: report and persuade. For this activity, students write three headlines for a preselected book that reveal key elements such as plot, character, and setting. They should try to find unique angles into the story that would catch attention while still being relevant to the story. This is also a great lesson to pair with rhetorical devices. Students should try using rhetorical strategies such as alliteration, puns, and repetition to make each headline catch more attention! Students then explain how the headlines connect to the book and how they grab attention. Instagram is a popular social media platform that allows users to create magazine-like layouts of images, leave comments, and use hashtags to target key concepts and ideas from posts. But— you probably already knew that! What kind of content would this character post? How would this character explain each post? What kind of language would this character use? Who would this character follow on Instagram? Who would follow this character on Instagram? What kind of comments would people leave on this character’s posts? How would this character comment on other posts? Who is friends with this character? Who is related to this character? A clever name for the podcast including a catchy introduction. The students’ initial thoughts about the novel and how they changed (or didn’t over time). A brief biography of the writer with relevant background information. A fun element such as a quiz game or challenge. Students should be creative! A discussion of how the novel connects to other pieces of literature, historical/ current events, and/or the group members’ lives. A recommendation of the book. Would you recommend this book to others? Students should create their own rating system for the novel. What activities and projects do you like to do with your students during a novel unit to target essential skills? Leave us a comment! We’d love to hear from you!